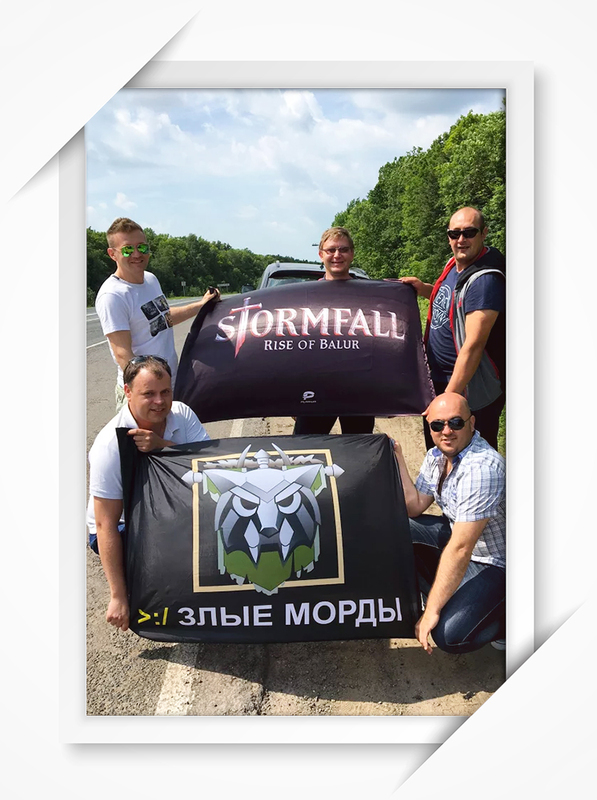 Natalia Pan, one of the founding members of the Zlye Mordy (“Angry Muzzles”) League in Stormfall: Rise of Balur, talks about hosting her very first League Gathering. About to host your own League Gathering? Let us know and we’ll provide you with your very own Plarium flag. 1. Tell us a little about your League. How did it all start? How did you manage to bring together such a friendly group of players? It’s hard to believe but it all started more than two years ago now. And, as it so often happens, it started with a misunderstanding. I left my first League and, quite unexpectedly, a few others — now my good friends — quit too. We created our own League, grew as a team, and always tried to help one another in any way possible. Then we teamed up with the Triada League. Later some guys from the Zatmenie League also joined us — now we all are Zlye Mordy (“Angry Muzzles”). 2. Had you held League gatherings before? No, this was our first time meeting as a League. Some of our members were already friends outside of the game, but none of the rest of us had ever met in person. 3. How did you come to organize this gathering? Was it a team decision or did someone in particular put forward the idea to meet up? It began with flags. More accurately, a photograph found by Arlekino in which American and German players, standing side by side and smiling, held a flag with the game logo. “Aren’t we just as friendly?” we said to one another. Why not give it a go then? 4. Who was in charge of organizing the gathering? How did you pick the venue and how did the preparations go? We just saw the flag photo and that was that — we wanted to meet as a team too. Iana (scania90) lives near a beautiful area by a river — that’s the spot we chose for the gathering. Rigl suggested we take a boat and a large car. Next we scoured the area for a decent venue. It was a real challenge to bring everyone together. In the beginning, there were 16 of us who were ready to come, but as the date approached, the number of those committed to attending halved. Surprisingly, the League member from the furthest destination, Norway, managed to make it to the party. As you see, it wasn’t a single person in charge of organizing our gathering — everyone played a part. 5. Did you like the flag you received? We received the flag one day before our departure and it was so inspiring! We also made our own flag — this one with our League’s logo. Arlekino helped us create small flags for each participant. We were very excited! 6. How did you like the gathering? Are you planning more meetups in the future? We had a real blast meeting one another and enjoying the local nature. Our trip lasted three days, including one travel day. The time passed so quickly! The guys came up with a variety of entertaining activities. “Greshnik” cooked an unforgettable rice pilaf. We spent a day at the beach and went boating. Traveling to and from the venue was also filled with lots of fun. Early in the morning we departed from Moscow. We then made a stop in Ryazan to pick up our “cook”. VYV and Pakemoshca gladly agreed to take the route via Ryazan. Oleg and Rigl drove straight to the venue. On the last day of our gathering, we visited a local sight: an actual castle! Now we’ve all agreed to meet up once or twice a year. 7. What advice would you give to other players who, like you, want to host a League Gathering? It’s totally worth it! It’s like visiting with old friends. To be honest, I’m a rather reserved person and not very comfortable around people I don’t know well. I was afraid that adults who only share one thing in common, a game, would not have that connection we had. But I was wrong. We met and become soulmates! It’s too bad that not everyone could come, but it was still so much fun. Just do it! And thanks for the flag!